Designed for the professional, these tripod ladders boast a max working load of 150kg. They’re also built to cope with uneven terrain, and feature 3, micro-adjustable legs that can be positioned to work on sloping ground. Coupled with their wide footprint and stable design, this added functionality makes our professional tripod ladders a great choice for any job. 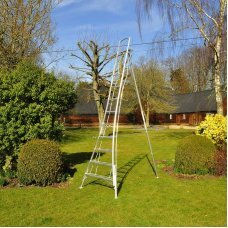 Whether you’re pruning tall trees, trimming topiary or even cutting down low hanging branches, these ladders have got you covered. All of the tripod ladders available here are manufactured by Henchman; a trusted brand that supplies local councils and organisations like the National Trust. What makes a Tripod Ladder safer than a normal ladder?Three is the magic number! Provided you can ge..